What a rollicking good read! 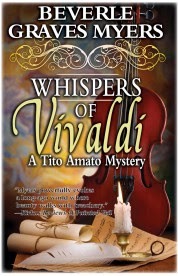 Whispers of Vivaldi is a murder mystery that is set in the gloriously flamboyant Venice of 1745; and the protagonist, Tito Amato, is former star opera castrato who has lost his voice and has a nose for investigating. The tale involves the competing interests of two rival opera houses to present the perfect opera, the extreme measures directors of the theaters would take to gain the advantage, and the reliance of the artists upon the whims of the elite for political and financial support. Amato stumbles upon the libretto for an opera written by an unknown that reminds him of the lyrical beauty of Vivaldi’s finest work. But the Teatro San Marco needs the approval of the cultural officer to stage the production. Amato gains approval, but only if the Teatro San Marco is able to procure Angeletto, a newly discovered castrato sensation in Milan, to play the lead role. Rumors abound about whether Angeletto is a true castrato or an imposter. A beloved Venetian maestro is murdered and Amato is the prime suspect. He must use all of his sleuthing skills and resources to save himself and discover the real killer. This is the 6th book in the series but the first I’ve read. The author paints a delicious portrait of Venice in the waning days of its glory. Tito Amato is an engaging character and the story is well plotted. It is also clear that Ms. Myers has performed a great deal of research on 18th Century Venice. I am eager to read the other offerings in this series. This book will be released January 2014. Disclosure: I was provided with a galley free through netgalley.com to read for a review.